Yamaha has released a short press release with a detailed video explaining the technology incorporated into the NIKEN three-wheeler’s steering system. Powered by an 847 cc triple, the NIKEN will be in U.S. dealerships later this year. If you haven’t ridden a leaning three-wheeler before, MD discussed the incredible front-end grip, and confidence, provided by a similar platform in its review of the Piaggio MP3 500 ie. You might not be dragging your elbow like Marc Marquez, but the new NIKEN, and other similar three-wheel models coming thereafter, might give you the confidence to explore deeper lean angles than you ever have before. 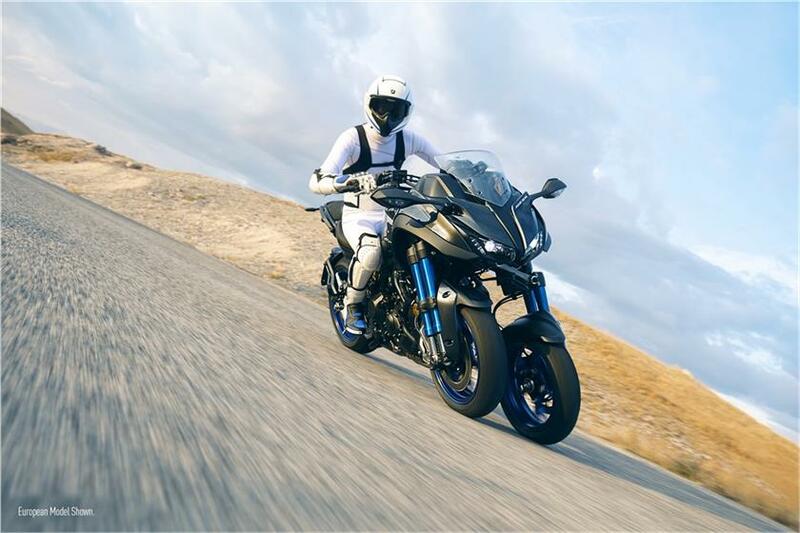 Launched to the world at the EICMA motorcycle show in late 2017, the all-new Yamaha NIKEN is about to open up a whole new dimension in riding control. With its revolutionary Leaning Multi Wheel (LMW) platform, the NIKEN introduces a totally new concept to the world of motorcycling, and takes corner carving confidence to another level. The new NIKEN has many rider benefits coming from the unique new technology, and the new technical video released today by Yamaha gives a full explanation of the key features used in the new LMW design. The video shows it all, from the LMW system’s parallelogram link design through to the offset joints and dual tube inverted forks – showing how each component contributes towards the NIKEN’s excellent cornering performance together with its unique and sporty riding experience. Viewers can also see how the unique hybrid frame combined with a long aluminium swingarm and model-specific chassis geometry work together to create one of today’s most innovative and exciting new models. I am wondering, people whom have a disability which prevents them from riding a two wheel motorcycle (legally) – will this be a legally viable option? If yes, then its not only a good and innovative idea, it would be a great idea. I’m sure the law varies from state to state, country to country. I’m not aware of any laws in my area that prohibit one from riding a motorcycle, other than not being able to pass the test. In any case, the Niken really isn’t designed for disabled riders. The dynamics of riding it, sitting on it, and pushing it around are exactly the same as any regular motorcycle. If you can ride a Niken, you can ride any other bike. Depending on the type of disability one has, there are better options such as the Can-Am Spyder, standard “trikes”, or sidecar rigs. Are you speaking of your own situation, or just asking in general? Oh, good. My answer to your post is “in moderation”. Wait 5 hours and you, too, can view it. What a handy feature on a comment board! 45 degree max lean angle. what then? inboard tire lifts? the front end weight…. OMG. And just as clear, you are definitely not in the market for this kind of motorcycle, so what do you care? I liked the NeoWing concept better, with the parallelogram suspension between the front wheels, rather than above them, with 4 fork legs. Just keep in mind… three points define a plane, rather than just two points defining a line. The most stable shape is a triangle, and the most stable form is a triangular pyramid. Think of a leaning reverse trike, as a dynamic, adjustable triangular pyramid, with three points on the ground, even as the pyramid moves across a changing surface. I don’t know if this is a great idea or if we’ve just run out of ideas on how to improve the 2-wheel motorcycle. In any case, it’s nice to see Yamaha think outside the box. If a car with 4 wheels can lose its traction on the road then so can this thing. Grip is not guaranteed in any vehicle. If someone believes they can now ride more recklessly because of a third wheel they are in for a rude awakening. And who ever said or implied that was the case? …and the point of your sarcasm is ? Ok, so add a leaning spare wheel into the huge front gap, add a roof, and call it The Yamaha Robin. Not for me…but keep the forks serviced and tire properly inflated and it could be fun for someone else.